A multi-million-dollar banking flap being investigated in Vietnam this month casts light on a tough corruption problem that nips at the Southeast Asian country’s explosive economic growth. The Vietnamese Ministry of Public Security last week began investigating three companies under state-owned gas and oil giant PetroVietnam on suspicion of trying to divert $5.2 million from OceanBank, a domestic financial institution. 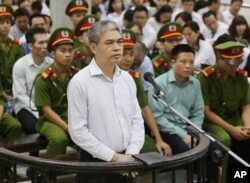 The case, analysts say, points to widespread corruption Vietnam. They point to construction, land use contracts and government procurement as particular sore spots. People are also asked for side payments to process official paperwork or get out of traffic violations. “In terms of corruption in Vietnam, I do think it’s a serious problem here and I think the government recognizes that,” said Frederick Burke, partner with the international law firm Baker McKenzie in Ho Chi Minh City. Corruption, known to cause waste in business, could hobble economic growth. 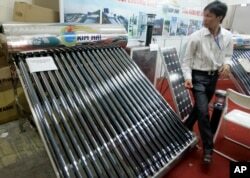 FILE - A solar water heater, left, and a solar panel, right, are seen at Entech Hanoi, an international trade fair on energy efficiency and the environment, at the Giang Vo Exhibition Center in Hanoi, Vietnam. Growth driven by export manufacturing makes Vietnam a darling in Asia among foreign investors. The economy grew between 5.2 percent and 6.68 percent each year from 2012 to 2016. The nonprofit advocacy group Transparency International placed Vietnam at 113th out of 176 countries and regions that it evaluated in 2016 for perceptions of corruption. New York-based business compliance consultancy Gan Integrity calls corruption “pervasive” in Vietnam. It says companies are likely to face bribery, political interference and “facilitation payments” across industries. Land development and construction fall especially to corruption, the consultancy says. Inadequate salaries for government workers, some of whom need extra money to provide for their families, causes a lot of the corruption, said Trung Nguyen, international relations dean at Ho Chih Minh University of Social Sciences and Humanities. FILE - A bank employee checks Vietnamese dong banknotes at a bank in Vinh Yen city, Vietnam. Complex regulations have also pushed companies to seek permitting shortcuts, another source of corruption. People with capital sometimes hold back expansion to avoid getting enmeshed in graft, adding to a large underground economy, Nguyen said. He added Vietnamese also face graft when they ask government offices for documents and if police stop them in traffic, eroding overall public confidence in government services. The PetroVietnam probe, as described in Vietnam’s English-language media, fits into a bigger issue at OceanBank. Reports say more than 50,000 people and 400 organizations benefited from what prosecutors call illegal interest payments worth $70.4 million. 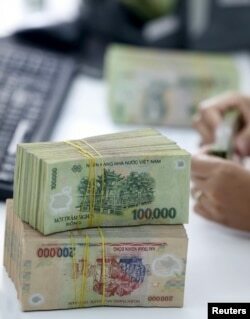 From 2010 to 2014, bank executives offered loans and set deposit rates, above state-approved limits to key customers, including PetroVietnam, local media have reported. The Vietnamese news website VnExpress calls this case one of the biggest bank fraud flaps ever brought to court in Vietnam. Some legal cases start with allegations brought by unhappy company employees, Burke said. Only “squeaky clean” firms can build reputations strong enough to eliminate solicitations for graft, he said. Multinationals get used to graft as a cost of business in emerging economies, Song said, but countries that try to stop corruption grab more sympathy. Around Asia, investors face similar barriers in Indonesia, the Philippines and China. Most countries around the Asia Pacific ranked in the lower half of the 2016 corruption perceptions index. Government attention to the issue has surfaced in Vietnam with the roll-out of the Anti-Corruption Law in 2005, a 2009 law on government procurement and the National Strategy on Anti-Corruption, which is due to run through 2020. Domestic media may be widely reporting the OceanBank case to discourage others from graft, Burke said. Nguyen Xuan Son, former general director of Ocean Bank, appears in a court in Hanoi, Vietnam, Monday, Aug. 28, 2017. Son and 50 bankers and business executives were put on trial Monday for alleged graft and mismanagement causing $69 million in losses to the bank. In October 2016, the government gave an unusually candid report to the legislature, saying numerous officials had been “neglecting their duties and failing to uphold moral standards and political virtues,” VnExpress reported. Gan Integrity says sentences for graft in Vietnam range from fines to capital punishment, but that enforcement is lacking. But Transparency International says it sees little public information about the outcomes of anti-corruption work.